This kit should be installed by someone familiar with automatic transmission repair and assembly. BTE recommends following a Transmission Repair Manual for disassembly and assembly. BTE can supply you with this manual. BTE Super-Pro Style Brake valve body functions only in low gear when the transmission brake button is activated. Reverse will only function with the shifter in reverse and Transmission brake button activated. This kit is not designed to repair a transmission that is not working properly. Inspect front pump - It MUST be in excellent condition to allow the Super-Pro Style Brake to work properly. NOTE: To install a Supe- Pro Brake valve body you will need a BTE racing overhaul gasket, seal kit and automatic transmission fluid. BTE can supply you with these parts. We also have Kevlar Bands and Racing Clutches. STEP 1 Remove pan, valve body, tailhousing, governor support, front pump, band, clutch drum, planetary, reverse clutches, reverse piston and detent plate. STEP 3 Area marked "B" will be the place to drill a new hole. (See Photo 2) You will drill a 5/16” hole into the reverse piston area. Deburr both ends of hole. NOTE: When holes "A" and "B" are drilled properly, you can see all the way through the case. STEP 5 Clean case thoroughly to remove any debris or aluminum shavings. STEP 7 Check high gear clutches. It there is a wavy cushion plate present, discard and replace with two (2) flat steel ones. Clutch clearance should be .050" to .070". 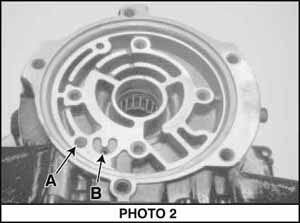 STEP 8 Transmission Case Identification: 1962-66 early transmissions are equipped with a rear pump assembly and use a tin wear plate. The reverse piston feed (hole) is located at the 11 o'clock position. 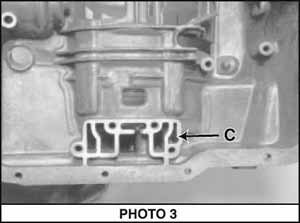 The 1967 and Later rear support has no pump gears and uses a paper gasket. The reverse piston orifice (hole) is located at the 7 o'clock position. You must use a late model (1967 & Later) rear support on both model cases. BTE can supply you with a billet aluminum after-market support with roller bearing to work on any case. 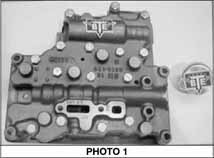 Before assembling transmission, remove the following, if equipped: Governor assembly, rear pump gears; vacuum modulator, modulator valve and spring. Governor support must be left in transmission except on "Shorty" transmissions. NOTE: Use rear plate on any model Powerglide transmission. STEP 9 Reinstall servo tube in valve body. STEP 10 Install the O.E.M. manual control valve in valve body. STEP 12 Install brake valve into top of valve body and install valve body into transmission. STEP 13 Install solenoid into modulator hole. Solenoid will activate brake valve. STEP 14 Connect the micro-switch brake button and the solenoid using a 12-gauge wire. STEP 15 Adjust low band and fill transmission using BTE Transmission Fluid. DO NOT OVERFILL! Band adjustment: 72 inch/pounds and back off 3½ turns. Torque large nut to 32 foot/pounds. STEP 16 The BTE Super-Pro Brake must have a HOT 12-volt battery fully charged to make solenoid work properly. STEP 17 A transmission cooler is required for heat dissipation. NOTE: Heat is your worst enemy when working with transmissions. A transmission cooler can make your transmission last 50% longer. BTE can supply you with the correct cooler. If you have any questions regarding installation, please contact our tech service department. This kit contains everything you need to rebuild your own racing transmission. Included are High Performance Clutches, Seals, Gaskets, Teflon Rings, a Kevlar Band and 7-piece Bushing Kit.